Last night, GForces attended the AM Awards, one of the most important events in the UK automotive calendar. We joined the best and biggest names in the industry at the ICC Birmingham, all eager to find out who would be taking home the prizes. With so many of our clients on the shortlists of each category, we knew we were in for an especially exciting evening. And we didn’t have to wait long before we had good cause to feel so confident. The first award of the night also saw the first of our clients crowned, with Marshall Motor Group taking Best Use of Social Media. A little while later, Yeomans Toyota were the next of our clients to be recognised, as they claimed the Best Finance & Insurance Performance category. Following close behind were Jardine Motors UK, who were recognised for their Excellence in Customer Service. Completing our straight hat trick of client wins was Swansway Group, who walked away with the award for Excellence in Aftersales. In the name of good sportsmanship and modesty, our clients very kindly then let a few other notable names take the stage before Volvo Cars London helped a return to winning form as Most Improved Dealership. 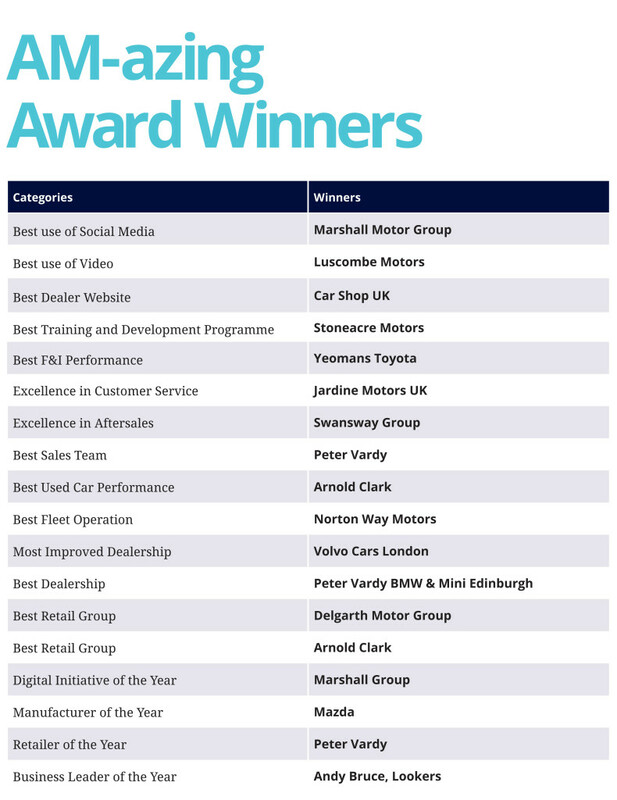 Marshall Motor Group then went for the double, adding Digital Initiative of the Year to their prize basket. You can find the complete list of winners in the table below. We would like to offer huge congratulations to everyone who won, as well as those shortlisted. The exceptionally high level of competition just goes to show how dynamic, versatile, and adaptive the industry is, and the changes each year brings as we are challenged to engage at even more intricate levels with connected consumers. We would also like to add our personal congratulations to Andy Bruce, Chief Executive of Lookers, who was named Business Leader of the Year. With the group growing through a combination of innovation and investment, not to mention offering one of the most modern retail experiences in the UK today, it is an accolade clearly well earned. And with Michael Smyth of Swansway Group being entered into the AM Hall of Fame, we are thrilled to see his 50+ years of experience and dedication to the motor trade being recognised. As always, it wasn’t just retailers being recognised for their incredible contribution to the industry, but also manufacturers. We were especially thrilled to see long-term client and OEM partner Mazda UK announced as Manufacturer of the Year. Another OEM partner of ours, Jaguar, saw the F-Pace crowned New Car of the Year. Award-winning clients, cars and websites all in one night. A genuine well done to everyone from GForces.